The warm weather is here, and it’s the perfect time of year to get outside and have some fun with your family and friends. But it’s also important to protect your skin. 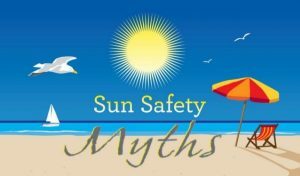 Here are five common myths about sun safety. Myth No. 1: It’s fine to tan as long as you don’t burn. A sunburn is certainly more harmful than a simple tan, but any extended exposure to the sun can be harmful, regardless of your skin tone. Myth No. 2: An umbrella will completely protect you from the sun. Though an umbrella will go a long way toward keeping your skin safe during a day at the beach, the sand still reflects 17 percent of UV radiation. Wear sunscreen in addition to staying in the shade. Myth No. 3: You don’t need sunscreen on overcast days. False! About 80 percent of the sun’s rays still pass through on cloudy days, so you still need sunscreen. Myth No. 4: The sun can’t pass through windows. Glass filters out some UV rays, but not all. Be especially cautious if you or your passengers are exposed to the sun on a long car ride. Myth No. 5: You need sun exposure to avoid vitamin D deficiency. Extended exposure isn’t necessary—your body will get enough vitamin D from food, multivitamins, and minimal time in the sun.